And this defense company wants to make these drones the frontline soldiers of the future. 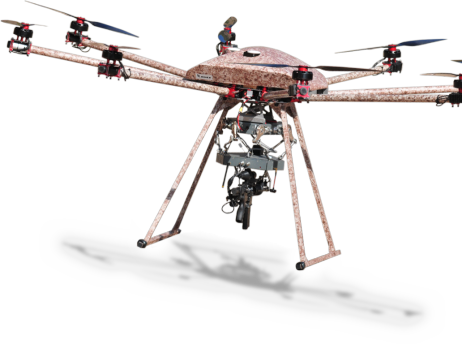 A defense company called Duke Robotics, Inc. now wants to make armed drones the standard of warfare using a system that looks as ordinary as hobbyist multi-rotor drone — with a machine gun or sniper rifle attached to it, of course. Armed drones have seen war-time action since 2001, but the most popular of these robots has long been the U.S. military’s now familiar unmanned aerial vehicles, called Predators. Image credit: Duke Robotics, Inc.
Duke Robotics claims they are currently in talks with Israel for preorders of the TIKAD. If these drones see action, it would be easy to send them to distant locations for quick operations and then have them fly back. Dangerously Close to a Killer Robot? Reducing unnecessary casualties in war is, of course, a noble goal. Drones make that possible are definitely high-priority, and there’s pending legislation asking for such a technology to be used by the U.S. military. However, the notion that you could put such weapons in drones that look as common as your regular quad-copter is somehow alarming. Adding to a sense of unease about the TIKAD, Duke Robotics has released a promotional video that feels like something made by Marvel’s fictional weapons developer Hammer Industries. Then there’s possibility that such a technology could easily be translated into a fully autonomous version. TIKAD is not autonomous— not yet, at least. For now, it’s operated using a video-capable control pad, similar to how Predators work. Behind the trigger is still a human being. But what happens when one is no longer needed? Such a technology makes the plea to the United Nations made by artificial intelligence (AI) experts about smart weaponry more urgent than ever.